We are excited! It is time again for our annual Dog & Cat Days of Summer event. Every Summer we set aside some time for our Limited Edition Pet Sessions to support the Roanoke Valley SPCA. We typically spend a Saturday photographing pets and collecting pet food for the RVSPCA Pets Eat Too program. This year we are changing it up! Instead of a Saturday, we have expanded it to 3 days. Thursday, Friday and Saturday (8/7-8/9/2014). 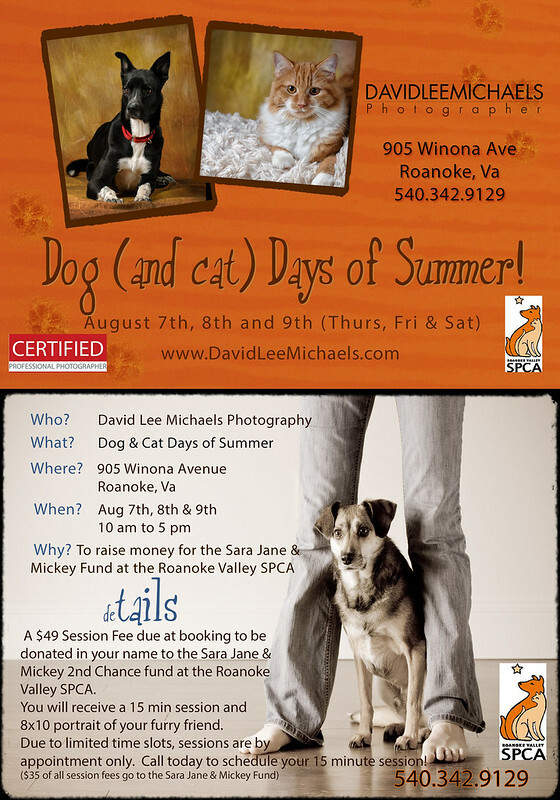 Also, instead of food, there is a $49 session fee to benefit the Sara Jane & Mickey Second Chance Fund at the RVSPCA. This fund provides for medical procedures outside the scope of the RVSPCA that will greatly enhance the adoptability of a derserving animal. Book your session, by calling the studio at 540.342.9129 or you can purchase your session online at www.DavidLeeMichaels.com. (just click on the Dog & Cat Days header) Once your have made your online purchase, we will call you to schedule your appointment. We will have a phone conversation about your pet and their personality. We will also provide you with tips to minimize an anxiety. Your session is about 15 minutes in length, with a variety of images taken. We then schedule a time for you to return and see your images on the large screen in our viewing lounge. There you will select the image for your 8x10 portrait for just particpating. You will have the opportunity to purchase wall portraits and additional gift prints at special Dog & Cat Days pricing, and we will make the donation the The Sara Jane & Mickey Second Chance Fund in your name. We always have fun, create some awesome images and lifetime memories. This is your chance to have the images you want, of your best friend, and you will help save the life of a pet and find their furever home. Tell a friend, Share the love and book your Dog & Cat Days Session today!